Eating vegan and vegetarian at Walt Disney World has certainly gotten easier over the last ten years. For goodness sake, you can get Gardein mock chicken at Coral Reef, and Tofutti ice cream is available pretty much everywhere for dessert lately. Back in my day, we were lucky to be served pasta with a tomato sauce that wasn’t a meat sauce, or grilled vegetables that hadn’t been sautéed in butter. That’s what they call progress, dears. I used to pack a small suitcase full of snacks so I wouldn’t want to gnaw my arm off during a five night trip, and now vegans actually have choices, and they’re usually really good! I find, though, despite more and more vegan offerings popping up throughout property, many of us still stick to the same restaurants. I don’t know about the rest of you, but I have this weird fear of missing an opportunity for good food. Sometimes I almost prefer not having more than one option on the menu because having an actual choice will result in a 15 minute long internal debate about which item I should choose. It often sounds a little like this: “…but this one has mushrooms, I love mushrooms” “yeah, but this one is cooked in a fancy-sounding sauce” “but mushrooms!” “but fancy sauce!” …and it just doesn’t stop. So, when I find something good, I often stick with it. As many Disney-visiting vegans will tell you, sticking with it means visiting the same mainstays on each trip, most often, Sanaa, Jiko, Boma, Kona Cafe, and the aforementioned Coral Reef. When I have the occasion to visit a restaurant at Walt Disney World, it’s usually one of those. Usually, until this past weekend when I found myself with a reservation at Narcoosse’s for the first time ever. At first glance, the menu at Narcoossee’s is very heavy on fish dishes with nothing on the menu looking even remotely vegetarian. However, this restaurant warrants a second glance. You just have to take this second glance to the actual restaurant and ask the friendly hostess if any accommodations can be made for your dietary preferences. Well, in this case that second glance will show you a vegetarian menu where everything can be made vegan! Who knew? Not me! Did you know? If you did, why have you been holding out on me? After deciding to not cancel the reservation, I got a little fancied up for dinner and encountered one of the kindest servers in the World. She double checked on the sourdough bread (vegan), and brought out olive oil to replace the butter without me even requesting it. A+ already! She mentioned that the Tofu dish was already vegan, and the other two could be made vegan by omitting the cream sauces and cheese. Wonderful! She also noted that the Pan-roasted Joyce Farms Chicken on the regular menu could be made vegan just by substituting tofu for the chicken. Cha-ching! I was able to try both the Coriander and Shichimi-Spiced Seared Tofu dish and the Pan-roasted Chicken (minus chicken, plus tofu). Both of these options were really great, and way exceeded my expectations. In both cases, the tofu was grilled, so it was firm compared to just getting cubes of heated soft tofu (which happens quite frequently). 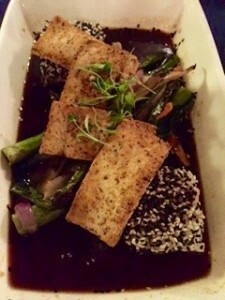 The tofu dish featured sesame sticky rice, which was both awesome and something I haven’t seen at a Walt Disney World restaurant before. It was also heavy on vegetables which is another big plus. The sauce was soy sauce-based, so if you’re not a huge fan of soy sauce you might want to choose a different entree. I really enjoyed it, though, and the charred beans were a nice addition too! The non-chicken chicken entree featured a pasta sofrito, which was basically a delicious couscous, which is a welcomed departure from regular pasta or rice noodles. It featured tasty grilled vegetables and a light peach mostarda — essentially a peach-flavored mustard sauce that did not taste or smell much like mustard at all. Trying both of these exceptionally good dishes makes me really excited to go back and try the Trophie Pasta some day. I do love mushrooms, so it only seems like a logical choice for next time! Though I was too full to even look at dessert, my kind server offered not just Tofutti but a choice! Aside from vanilla and chocolate Tofutti, they also had Rice Dream, a coconut milk-based ice cream along with sorbet and Enjoy Life cookies! She even offered to add a raspberry sauce to the ice cream, which would also be vegan. Next time, I’ll be sure to leave room for dessert. The only thing that could outdo the food at Narcoossee’s is the atmosphere. There were lots of families having dinner although it might be best suited for pre-teens and older kids. The restaurant itself is quite pretty with large windows spanning most of the restaurant, and has a great atmosphere for a romantic date. My reservation time allowed me to enter just before sunset and see the sun dip behind some clouds just beyond the Magic Kingdom. My purposefully slow eating then allowed me to see Wishes about an hour and a half later. The fireworks view was phenomenal from the outdoor deck at the restaurant. The lights were dimmed inside and outside for better viewing and the music was piped in, too! 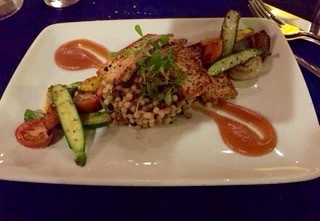 I’m so glad I didn’t let my fear of the unknown influence me to cancel my reservation at Narcoossee’s, it turned out to be more vegan-friendly than a lot of other restaurants I’ve tried at Walt Disney World! I’m glad to check Narcoossee’s off of my list, but look forward to adding it to a semi-regular rotation for special occasions. 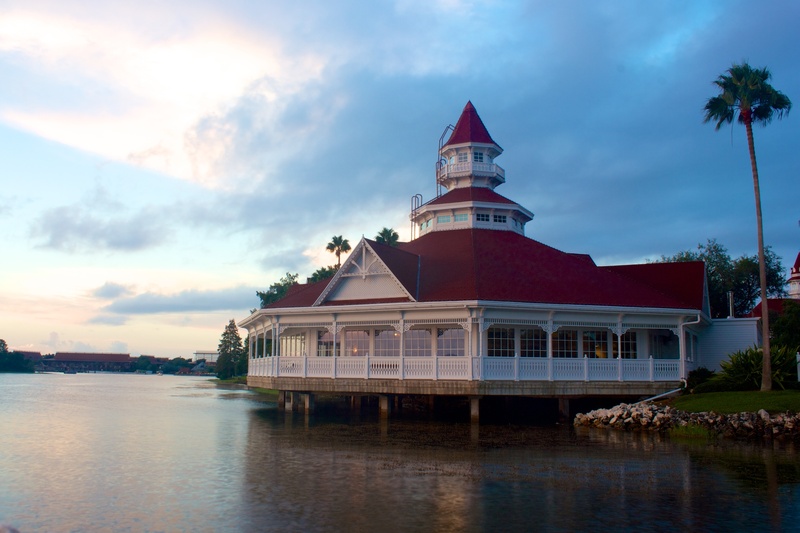 Which restaurants are in your WDW comfort zone? Where would you like to visit on your next trip? My husband is vegan, and we have enjoyed many meals at Disney through the years. We first had to call 48 hours in advance and speak with a chef so they could order something off the menu, but always great. Now we speak with the chef when seated and they often come out with awesome food, off the menu, or maybe a secret menu we do not know about. We have had Tonga Toast created vegan at Kona Café, beautiful meals at California Grill and Artist Point. Great meals at Crystal Palace, Coral Reef, 1900 Park Fair, Tony’s, and our last great meal was at Trail’s End. Do not be afraid of buffets, the chef will walk you through letting you know what is vegan, and if there is not enough often make something else for you. The vegan Tonga Toast is amazing! 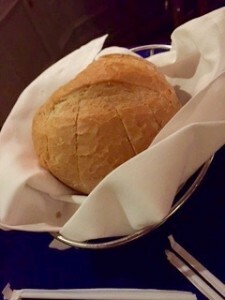 My famliy has had great meals at the places you mentioned too, including with Chef TJ at 1900 PF and at Trails End. Disney is truly a wonderful place to eat vegan. Thank you for reading! Isn’t the vegan Tonga Toast amazing? That, and a pressed pot of Kona coffee is my dream come true. I can’t believe I still haven’t made it to Trail’s End, I’m really looking forward to visiting since it gets such acclaim from the WDW vegan community! “That’s what they call progress”…yeah, OK.
Love that more of the sit down restaurants are starting to have vegan/vegetarian menus! Hoping someday they add options at the counter service restaurants too (like Sunshine Seasons), even 1 entree that was labeled vegan so we didn’t have to ask for a chef/manager to modify would be awesome! Definitely progress! I’m totally with you, Niki! I always appreciate when things are right there on the menu, and I don’t need to bother anyone about modifications. Thank you for reading! Can anyone help me find the number to give advance notice at restaurants? I have asked everyone , even emailed the special diets address and they all say you can no longer give notic, you have to just eat what they can come up with when you get there. I told them giving notice would allow them to bake something and they say they can’t. I have good luck googling restaurant numbers. I call around 3:30pm so they are not busy yet and speak to the hostess. Most times, when i request to speak to the chef I am able to get a call back at their convenience within a couple days. I like to do this to get a feel for my options, particularly for my vegan kids. Last February I asked several of them to order some Gardein Veggie Ckn for my kids and they did and were super nice about it. I also made suer they’d have vegan margarine for kids pasta as some places have it on hand and others dont so you need to request ahead of time. I googled Narcoossee’s number and got 407-824-1400. I plan to call later today to plan our Feb 2016 trip. Good luck!